Ever wonder just how high is high? Just how high is the Hubble Space Telescope at 371 miles (559km) and the International Space Station at 260 miles (420 km). Without a real Earth reference there is no way to tell. 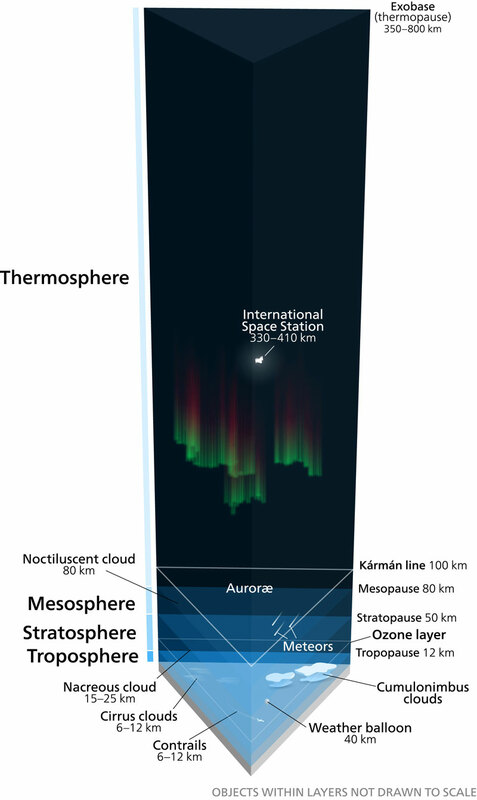 So I decided to see if I could make a 3D scale by erecting a tower of the Troposphere, Stratosphere Mesosphere, and Exosphere on top of Mount Everest and plotting clouds, the Ozone Layer and other items to give you some relationship as to their height. The intent is to enable you to evaluate it for yourself by looking up or down from the tops of the different atmospheric levels. The column is approximately 441 miles (709.721 km) tall. If you zoom out to see the top of the column, and use the compass to rotate and view the horizon you can view where the Hubble Telescope is with the cosmos behind it. If you then combine the map (as shown below) with the MODIS Terra Cloud Top Temperature map, located elsewhere on this site, you can see where the Terra satellite is and what it records. Combining other weather related maps on this site gives you an idea of what other satellites record. If you activate the 3D Terrain mode in the Base Globe menu, you can see how small the world’s largest mountain is compared to the atmosphere. Toggling the sunlight will give you a sense of night and day. Map: The Atmosphere of Earth by George Stiller and Jim Lee is licensed under a Creative Commons Attribution-NonCommercial-ShareAlike 4.0 International License. Based on a work at climateviewer.org/. Permissions beyond the scope of this license may be available at climateviewer.com/terms.